Fr Hunwicke's Mutual Enrichment: More advice?? I would have loved to share with you a malevolent Comment (no, I get remarkably few of those) which tells me that I am 'a nasty old married queen' and suggests that this category abounds in the 'backdoordinariate'. I would have enabled it for your diversion, but it also libels a brother priest. Surely such statements are vitiated by a lack of definition? Possibly also by a circularity of argument? What would that wonderful logician Peter Geach (friend of Wittgenstein, husband of Elizabeth Anscombe) have had to say? I've just heard of his death; cuius animae propitietur Deus. I pray that as a good Catholic he's gone straight to heaven because it would be yet more bad news for the poor souls in Hell to have been joined by that sharp and merciless intellect. Is Chris Grady still on about all that? I am so sorry you have had such a malevolent reply, Father. One often wonders where these venomous wails on the web (and in the public square) have there origin. 5 And always, night and day, he was in the mountains, and in the tombs, crying, and cutting himself with stones." Stout heart, Father! I keep you in my prayers. 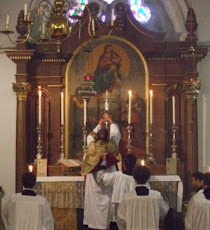 There’s nothing “back” about the Ordinariate. I’ve just finished reading a book, (Christmas pressie), about Catholicism in Elizabethan England and after. The tenacity with which a large number of Catholics clung to the Faith, in spite of persistent and vicious persecution, right through to the period of emancipation and Newman, is nothing short of astonishing. Incidentally, although the Jesuits get a lot of stick these days, their heroism in the face of unspeakable tortures at that time is, I can only say, humbling, since I am at a loss for words. I like backdoorinate, its an unintended backhander , surely? My village, as was way back when , some front doors were so painted you couldn't open them, friends and family used the back door exclusively.The Front door was for outsiders.